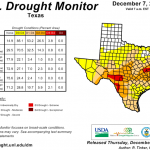 Back in July of 2009 I wrote about how one of the worst droughts in Texas was worsening. 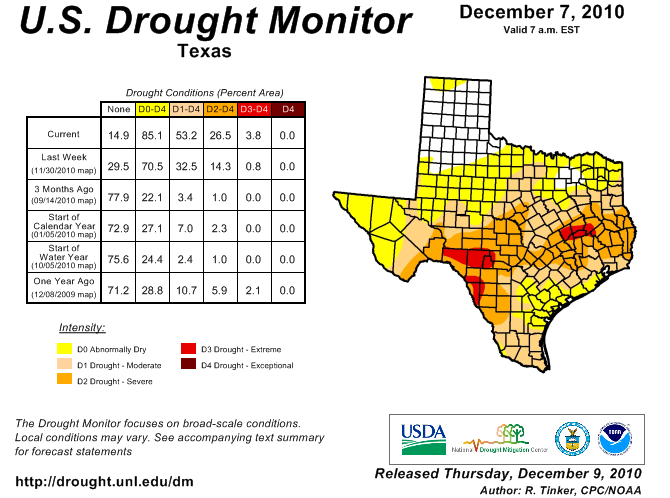 Now it’s December, 2010, and we are staring down the barrel of another (winter) drought – one of the worst. I appears to be the effects of La Niña. This certainly appears to be true. For the past week – 2 weeks before winter – the North Midwest (Minneapolis, Chicago, Detroit, Buffalo) has been buried by snow. This entry was posted in Nature and tagged drought, Texas, winter by Chris Siems. Bookmark the permalink.